We (Imperial College Caving Club) have been using a variety of 14.4 V drills during our summer expedition to Slovenia for the last decade. We've built up a good stock of 14.4 V batteries, and so despite the general shift to 18 V in the power tools industry, we've tried to make do and mend our existing stockpile of drills. We have four Makita drills (BHR 162 or DHR 164) which are all still working, but Makita no longer makes these and so eventually they will fail. We also have some Bosch Uneos in which the electronics have got a bit fried and need some serious attention. The Uneos are very small and lightweight, and so great for pushing the deepest bits of Sistem Migovec. It isn't currently possible to buy 14.4 V Uneos, they now only come in 10 V and 18 V variants. It arrived quickly and I opened it up. 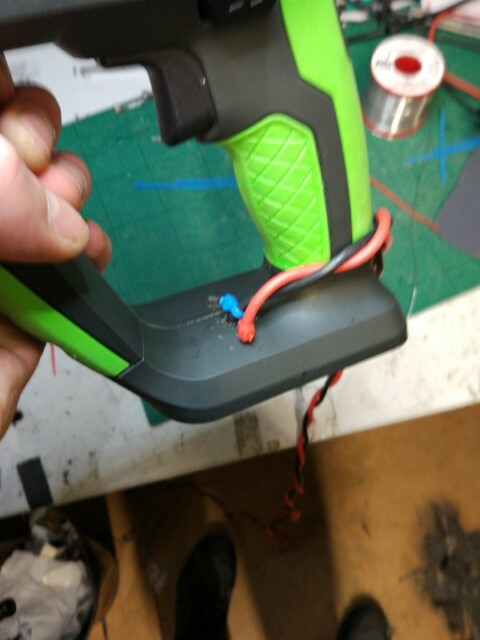 It's quite simple inside - electrodes from the battery (bottom right) lead to the trigger, and then wires go to the motor which drives a second shaft with the hammer on, which in turn drives the drill bit (sorry if my terminology is all wrong, I'm not a drill expert!). 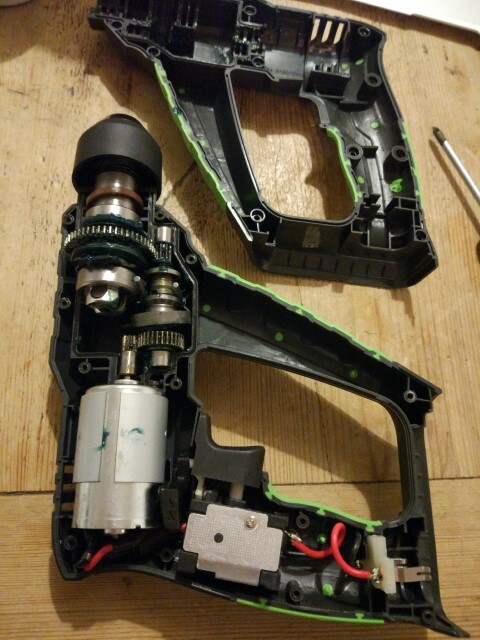 It took a while to everything back together, because the gear box kind of exploded, and in desperation I turned to Jarvist Frost's photos of the Bosch Uneo. The CEL is drill almost identical to the Uneo inside! 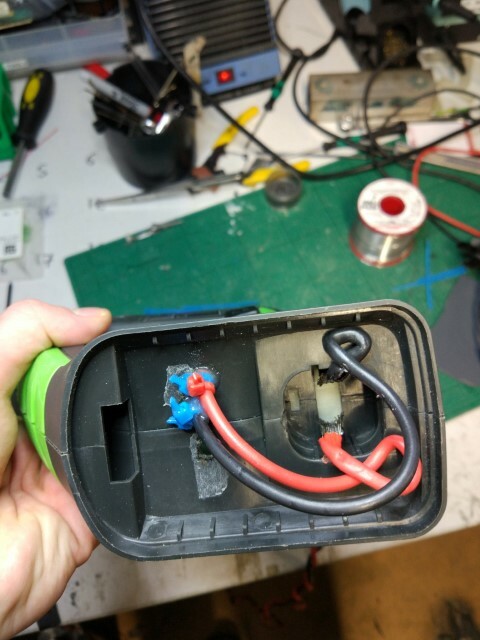 However, unlike the Uneo which had internal batteries (4x 18650s), this one takes an external battery - there's no complex charging circuitry inside, and the wires can be attached without opening up the drill (a big advantage for fixes in the field). 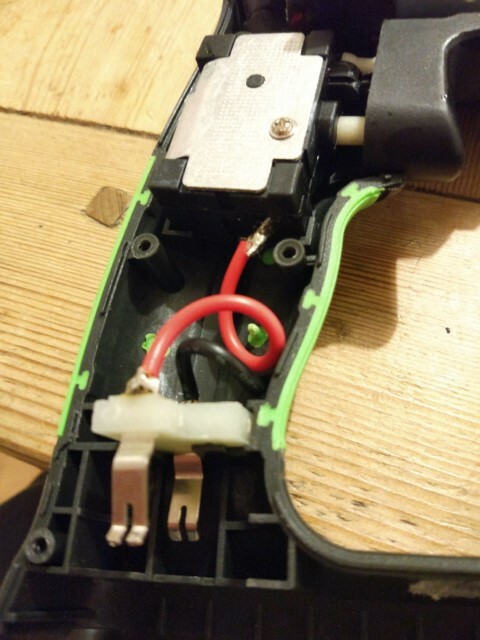 The electrodes connect to the trigger without any intermediate circuitry - easy! The wires coming out of the drill. Together with another club member, we set to work modifying the drill. We soldered the wires directly to electrodes, then poked them through holes we'd made in the plastic casing. We then attached cable ties covered in Araldite to provide some strain relief - pulling on the wires pulls on the casing, rather than the soldered contacts. We plan to make a thick plastic cover to seal off the opening at the bottom - it won't be water tight, but it should prevent the wires getting damaged or a stray bit of metal shorting out the contacts. I suspect there are much better ways to do this, but I'm not very experienced and have limited equipment - suggestions very welcome! So, now we have a drill. We don't know the build quality, we don't know how it will survive in a cave. But it takes 14.4 V batteries, it takes SDS Plus (so we can use our Hilti quadflutes) and it's very cheap and easy to modify. We'll let you know if it survives being dragged round a cave in Yorkshire, and how it handles itself in Slovenia. If you've got any questions or comments it'd be great to have your input! 4 Likes MarkS, Swallowneck, ImperialCollegecaver and ObviousSpectre like this. Looks great! Certainly handy to find a drill that's so simple inside. They seem increasingly rare these days. I'm delighted that write-up was of value to someone! What sort of battery do you use? The same Turnigy 5 Ah batteries you had for Durmitor, with powerpole connectors. It's easier to imitate than innovate! We currently have ten, which is overkill for our expedition (there are rarely more than three teams underground with a drill), and we charge off solar panels on the mountain. Fortunately we can leave these in a shakehole year round so we don't have the labour cost of dragging them up the hill every year!